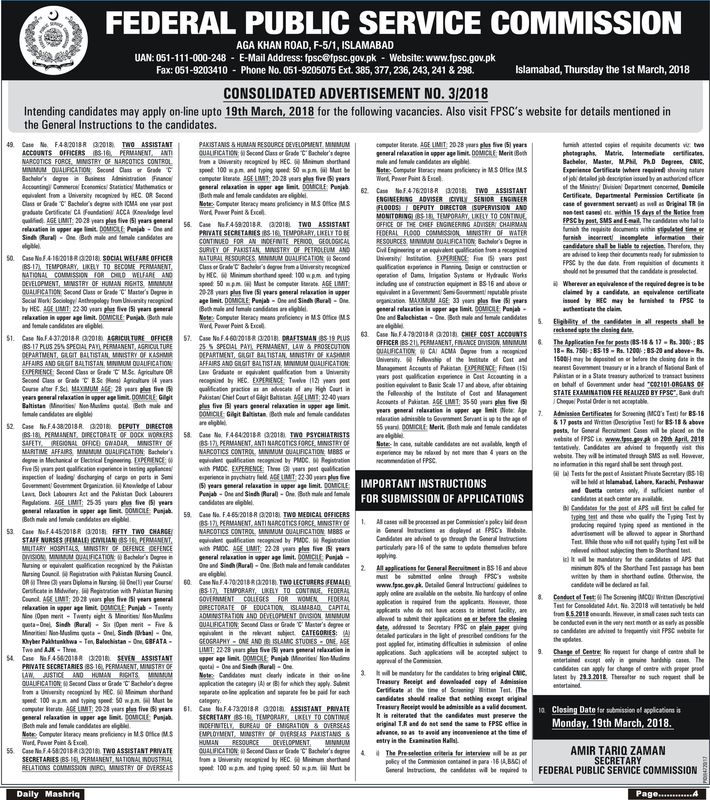 Federal Public Service Commission has announced New Jobs in Daily Mashriq Newspaper 04 March 2018. Candidates who have required Qualification and Experience may apply for Federal Public Service Commission Jobs 2018 by online registration at www.fpsc.gov.pk whereas who don’t have internet Facility are allowed to submit their application form on or before closing date to the Secretary FPSC, Such applications will be accepted subject to approval of the Commission. Following Posts are Vacant in Different Government Department of Pakistan, Assistant Account Officer, Social Welfare Officer, Agriculture Officer, Deputy Director, Charge/Staff Nurses, Assistant Private Secretary, Lecturers, Medical Officers, Psychiatrists, Draftsman, Chief Cost Accounts, and Assistant Engineering Advisor. These Jobs are Vacant in Ministry of Narcotics Control, Ministry of Human Rights, Ministry of Kashmir Affairs and Gilgit Baltistan, Ministry of Maritime Affairs, Ministry of Defense, Ministry of Law, Justice and Human Rights, Ministry of Overseas Pakistanis and Human Resource Development, Directorate of Education Islamabad, Ministry of Petroleum and Natural Resources, Ministry of Water Resources and Finance Division.